Fall is rapidly approaching. For me that means preparing the antennas for fall and winter contests, and the occasional DXpedition. Summer has been a down time for my radio activities, with travel, home improvements, sports and other activities. The articles in this blog have been sparse. Now is the time to get serious about antennas. The 6 meter yagi is now out of the way, making room for other antennas. There is little I can do for the high bands (20 through 10 meters) with my current supports so there will be no changes for those antennas. It is 40 and 80, and possibly 160, where I desperately need improvement. This is especially true if I again enter the QRP category in the major contests. On these bands every decibel counts when others can barely copy me, or not at all. Final decisions have yet to be made. Options are limited, as are the performance improvements. I'll take you through my thinking at this stage so you'll understand my choices. Later, when the antennas are built and tested, I'll relate how I came to do what I will have done. In this article I'll discuss 40 meters, deferring the other bands to future articles. My only antenna for 40 at present is a multi-band inverted vee at an apex height of 14 meters. One end is tied to the tower and the other to the house eaves. It is asymmetrical, though not by a lot. It is enough to skew the pattern, as you can see in the adjacent plot. 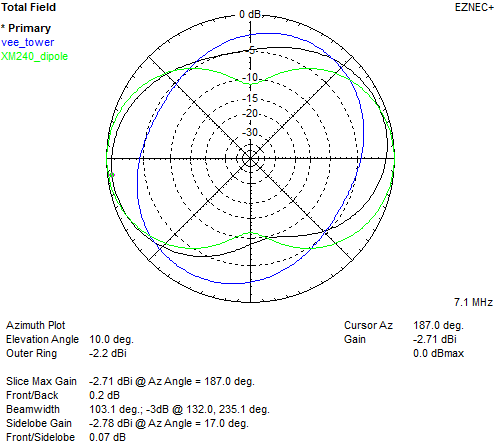 An inverted vee is not really an omnidirectional antenna, even if it is often billed as such. It is only more so than a dipole. You can read how I came to choose this antenna in an article I wrote in 2014. Notice the azimuth pattern, at a DX optimum elevation angle of 10°. I set up the EZNEC model so that east is to the right. The antenna is replete with compromises. Europe is down -2 db from where it peaks, as is much of the US. Asia is down -5 db and the southern US, Caribbean and South America are even worse. My operating experience tells me quite clearly this is hurting my contest scores and DX performance. I need a better or a second antenna to fill these gaps. My best options are as follows, as constrained by my property and supports. There will be no new tower at this QTH this year, and perhaps never. Inverted vee: Mounted at the top of the tower this antenna would have the same 14 meter apex height as the multi-band inverted vee. Made symmetric with an interior angle of 90° it would be oriented to be at approximately a right angle to the other inverted vee. In this way interaction with the tri-band yagi on 15 meters above it and the vees would be small. While a tight squeeze I have tie off points selected that would make this work. Omega-tuned boom dipole: This involves extending the boom of the Explorer 14 by at least 6 meters and making an omega match with the tap being a wire tied to the end of the existing boom and angled downward to the mast just above the mast bearing. This is a tried and true design that I previously considered but rejected because of the complexity of raising the extended yagi. That remains a task I am loathe to tackle. Rotatable dipole: The driven element of my recently-purchased Cushcraft XM240 can be mounted alone on the mast and rotated. It would be mounted parallel to the yagi's boom to avoid interaction, which I've modelled and seen that it is quite severe on 15 meters though acceptable on 20 and 10. At 43' long (13.5 meters) it fits within my 50' wide lot but in windy conditions could tangle with the trees that serve as the tower's guy anchors. Some careful measurement would be required. The wind load is substantial (~3 ft²), so it would have to come down after the winter season, before spring and summer storms arrive. All of these antennas would have a feed point at the top of the 14 meter tower (DMX-52) that currently supports a Hy-Gain Explorer 14. The RG-213 transmission line is what was used for the 80 meter half sloper and was temporarily used for the 6 meter yagi. That coax is now free since I have other plans for 80. I modelled the inverted vee and rotatable dipole in EZNEC and overlaid them on the azimuth pattern of the existing inverted vee. All are at an elevation angle of 10°. First, notice that the inverted vee on the tower has less gain at low angles. This is because the interior angle is smaller than on the multi-band inverted vee. The difference is about -1 db. Due to that and constraints on tie off points, it does only a modest job of filling in those pattern gaps. Northwest and southeast are worst.To the north the improvement is just 2.5 db and to Europe there is no difference. Where the new antenna does well is to the south where it is ~6 db better. This pattern of this inverted vee is more omnidirectional due to its symmetry, a symmetry that might not survive real-world interactions. The performance improvement comes at the expense of wind load and the need to rotate the dipole to get the most from it. Of course with both antennas online it is possible to switch instantly. At times when both high and low bands are open there is the additional matter of the dipole pointing of the side of the tri-band yagi. But it does allow working the US and points north and south while the yagi is pointed to Europe. The model view at right, with currents, shows the high coupling when the dipole is rotated to where both antennas are in the same plane. It turns out that interactions are a major determining factor as to which antenna I will go with. This can, and does, degrade both antennas' performance. The nearness of the ends of the dipole and inverted vee is not due to perspective; they are ~3 meters apart (the vee is tied off to the tower). For model simplicity the other elements of the multi-band vee are omitted since their effect is negligible. To test this out in the EZNEC model I fed each antenna in turn to estimate the effect of interaction. 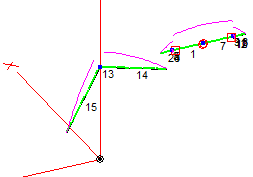 I then rotated the dipole to measure how the interaction changes with direction. When orthogonal there is little interaction. Compare the right pattern with the one at the top of this article. (The vee's pattern is not skewed; it has been rotated in the interaction model.) Low current on the inactive antenna confirms this. When collinear (in the same plane) the impact is large. Antenna lobes are no longer where we want them! However there is a gain effect, as in any parasitic array, with the amplitude of the major lobes 1 to 2 db higher than in the non-interacting (orthogonal) orientation. Unfortunately this gain is not useful or reliable. The SWR for both antennas in the collinear case are poor. Resonance is shifted and bandwidth is reduced for both antennas. Even if it were possible to live with the pattern distortion, the large swing in SWR is not tenable for most operating, especially contests, and would at least require frequent adjustment with an antenna tuner (preferably automatic). This analysis demonstrates the importance of checking interactions between antennas for the same or harmonically-related bands. My antenna decision is heavily constrained by interactions. I could not put up a rotatable dipole unless I remove the 40 meter element from the inverted vee. That is not desirable. In my earlier interaction modelling I was able to demonstrate modest interaction on 15 meters between the tri-band yagi and the 40 meter inverted vee. Again, worst case was when they were collinear (yagi pointed east). I judged the degradation to be acceptable: about -1 db gain, poorer F/B but little effect on SWR. Compromises are sometimes unavoidable. But you can't make an informed decision until the interactions are tested, in a model (preferred) or in the field. Spending time on this analysis saved me time and effort, and disappointment. Install the rotatable dipole and remove the 40 meter inverted vee. I would lose instant direction switching and have to do some mechanical work to modify the inverted vee and to install the dipole on the tower. The higher wind load is a risk, though I believe it is managable if I take the dipole down in early spring. But then I would have no 40 meter antenna at all. Build and install a second, 40 meter only, inverted vee on the tower, orthogonal to the first. I would retain instant direction switching and avoid destructive interactions. 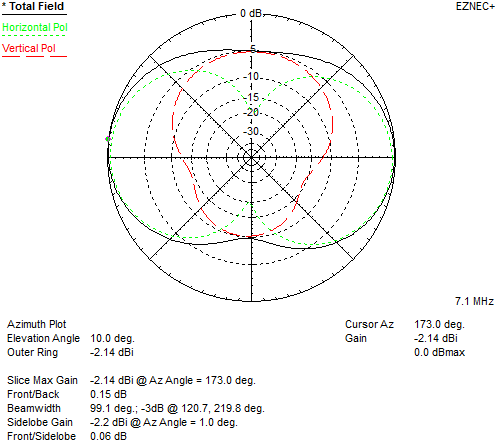 The 90° interior angle of the vee reduces gain but is necessary to avoid degrading the yagi's performance on 15 meters. Installation of this vee presents a mechanical challenge in that one leg has to be tied off at some height on a suitably placed tree. There is a wasp nest in the way (I'm allergic) that I'll have to first remove! I'll report back on what I decide to do. I may come up with a further option to consider. A subsequent article I will discuss my options for 80 and 160. I have fewer good options for those bands. I may decide to entirely forgo 160 this season. Interesting! Thanks for sharing your plans here - it's always fun to see what other people are doing.